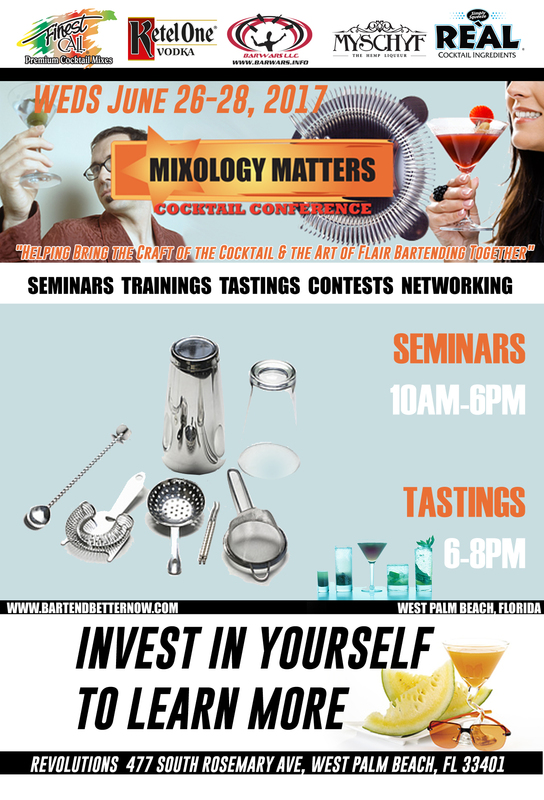 “Mixology Matters: Cocktail Conference” returns on June 26-28 2017. This celebrated event will take place during the day all leading up to the Bartender Shakedown finals later that night June 28, 2017 complete with cocktail samplings, seminars, demonstrations, Mixology contests, social networking, product awareness and much more. The idea is to expose the attendees to new ideas, procedures, trends, products and knowledge to further educate and motivate them at their craft. While also exchanging lines of communication, interests, passions and awareness to our exhibitors and attendees. This event is strictly 21 years of age and over and open to the public to attend and promises to be a fun and informative event! West Palm Beach, Fl (PBI) approx 5 mins away. Fort Lauderdale, FL (FLL) approx 45 mins away. Miami, FL (MIA) approx 1 hour away.